When Amazing Spider-Man #374 was released in February 1993, it had been more than four years since Venom was first introduced to the world by David Michelinie and Todd McFarlane. 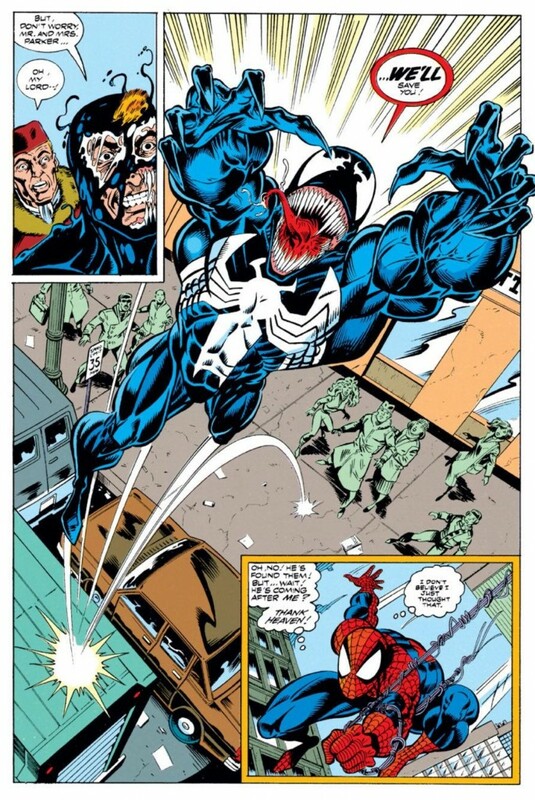 During that timeframe, Venom demonstrated his full range sociopathic tendencies, attempting to murder Spider-Man on countless occasions (including kidnapping him and hunting him on a deserted island) and threatening the livelihoods and sanities of some of those Peter Parker held dear like Aunt May and Mary Jane (though the danger was more “implied” than overt). 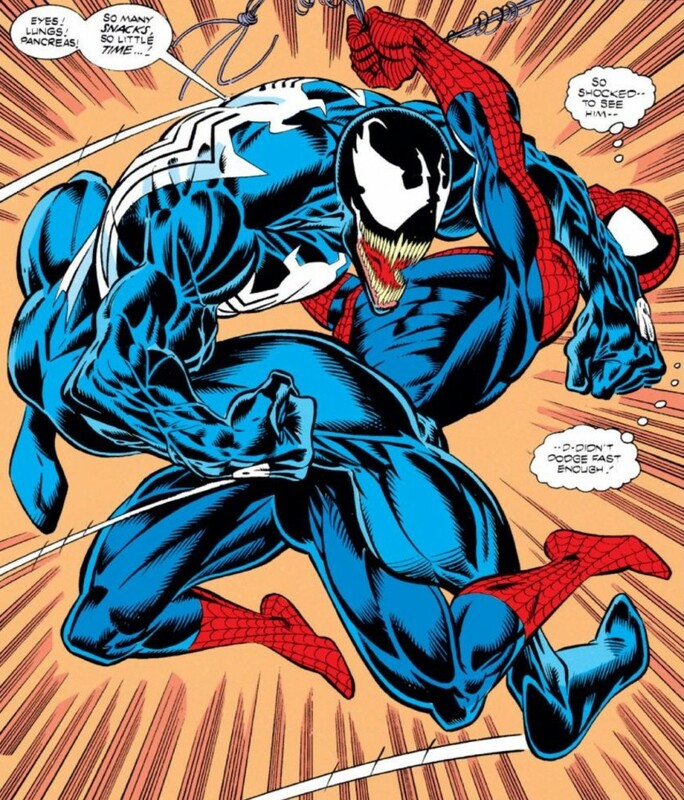 Readers even got a taste of what a “tweener” Venom would be like when he reluctantly teamed with Spider-Man to take down his “spawn” Carnage (before promptly turning on Spider-Man at the end of that arc). 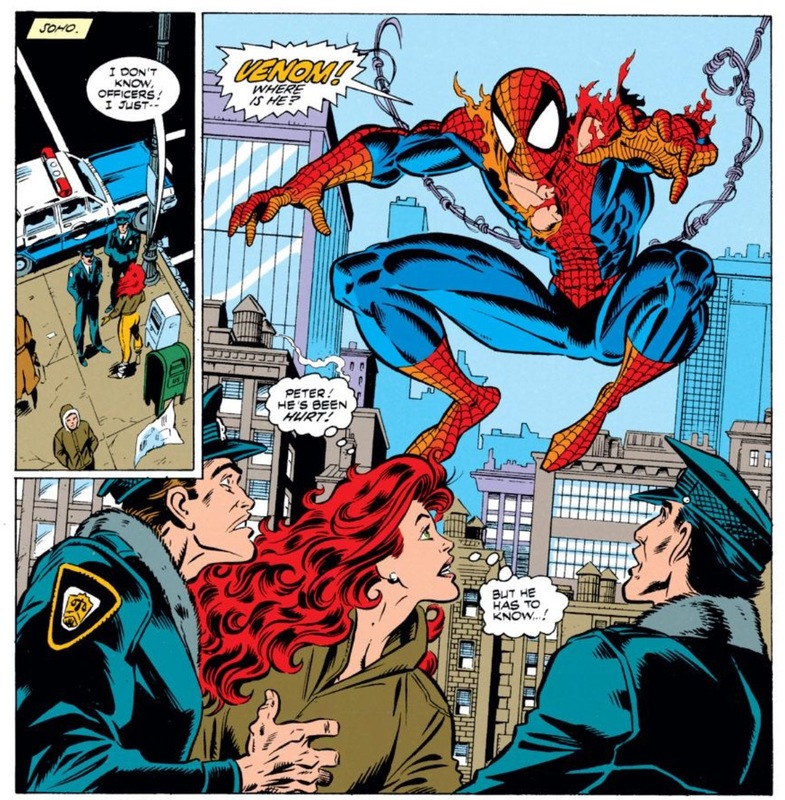 In short, with the help of three superstar artists (McFarlane, Erik Larsen and Mark Bagley), Michelinie had put, arguably the most popular character he ever created, through nearly every scenario imaginable. With every new storyline he appeared in, these Venom arcs gradually lost the special “event” feel, eventually leading to the character’s overexposure. That’s why I’ve come to view the two part ASM #374-375 as the official tipping point for the character, aka, the last great Venom story of the 1990s before he made the full transformation into a brain eating, poorly characterized symbol of Marvel’s excesses of that period. 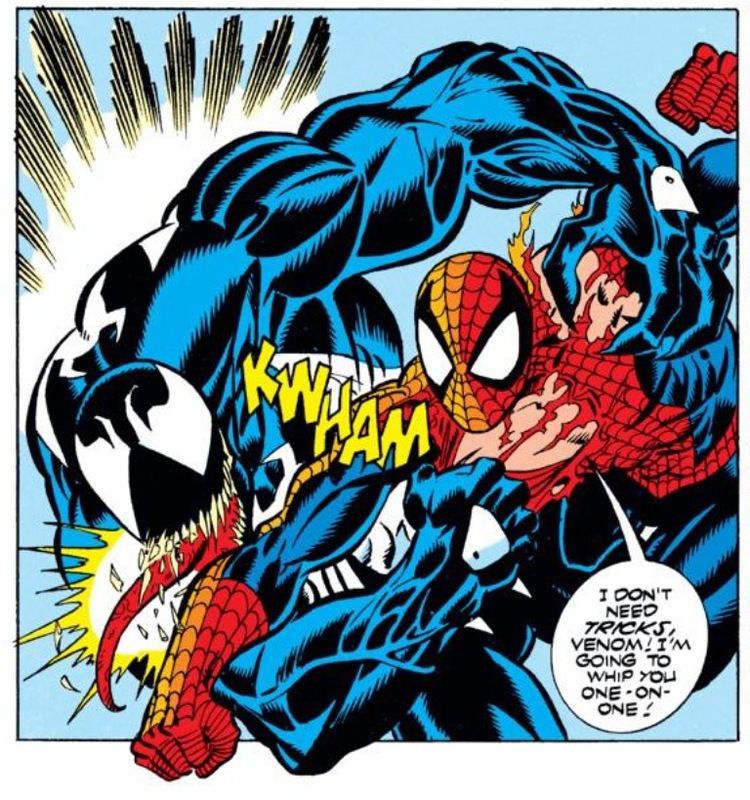 Probably many of you out there are shaking your head at the fact that I even dare to call this story “great” – I’m surely blinded to some degree by my 90s nostalgia, but the Michelinie Venom stories are the comics that hooked me on the medium as a kid. Of course, a big reason why I find this story to be so effective is how it adds another layer of drama and tension to the Spider-Man/Venom dynamic by involving Peter’s parents. 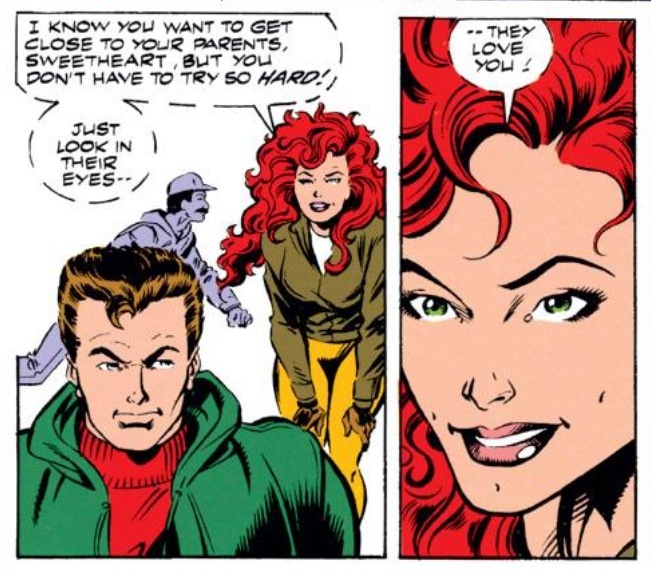 And that would of course prompt some of you who didn’t experience Spider-Man comics in the 1990s (or who have successfully forgotten Spider-Man comics from the 1990s) to scratch your head and say, “Peter’s parents? Wasn’t Peter an orphan raised by his Aunt May and Uncle Ben?” And you would be right, except that for nearly two years worth of stories, Peter’s parents were back after they mysteriously showed up at May’s house one day, claiming they had been held captive in a Russian prison for 20 years. The Parker’s were later revealed to be fakes, cyborgs sent into action by the Chameleon (who was having his strings pulled by Harry Osborn) as a way to strike at Peter in the most personal way possible. This storyline NEVER gets mentioned anymore in modern Spider-Man comics, though I would argue that it’s much better than people give it credit for being. 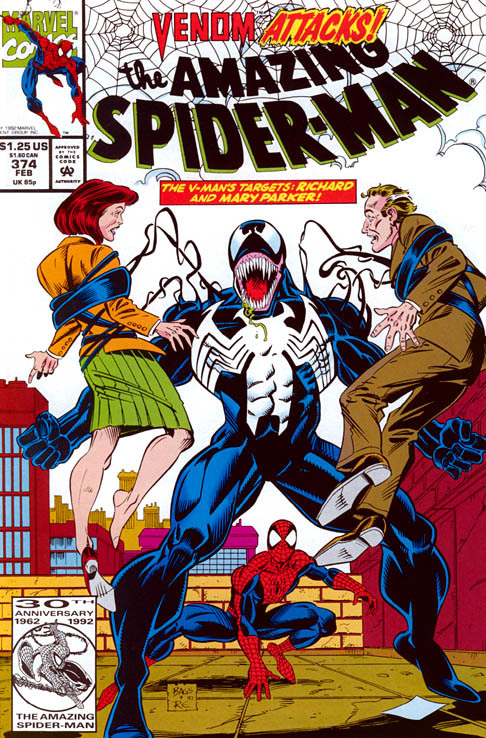 Still, in hindsight knowing how things worked out with Peter’s parents should probably diminish the standing of stories like ASM #374-375, since the drama was built on false pretenses, and yet I will continue to defend it as the last great Venom arc of the 90s … so sue me! False pretenses or not, Michelinie does an excellent job in this issue showing just how desperate Peter is for his parent’s approval and acceptance. At one point, he even fakes being a klutz on ice skates so as not to arouse any suspicion from his mom and dad about his secret identity as Spider-Man. Because Peter is clearly working so hard to recapture that child/parent relationship that was robbed from him years earlier, it makes his shock and dismay upon hearing the news that Venom has escaped prison (again!) all the more unsettling for the reader. And Venom makes no bones about his intentions with the Parkers, announcing his plans to both the reader, and eventually Peter himself. The only thing that remains up for speculation during the course of this issue is whether or not “rescuing” Peter’s parents from Spider-Man includes harming or killing them, or if Venom has some other master plan clicking inside his crazy brain. 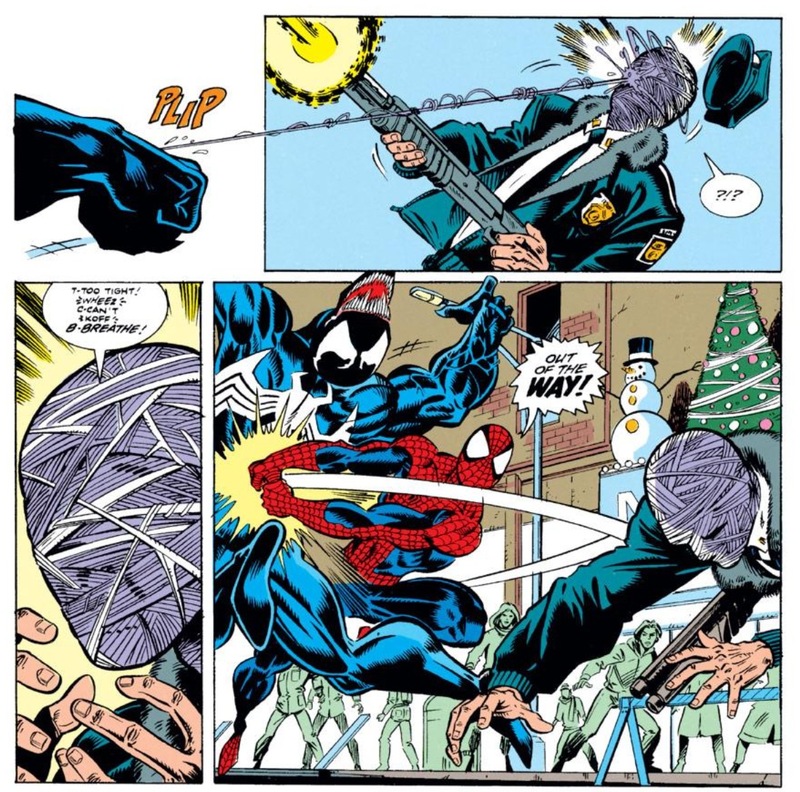 The ensuing fight between Spider-Man and Venom stands out because Michelinie and Bagley litter the battlefield, which traverses a holiday parade and a shopping mall, with innocents and children, creating a high level of discomfort and distraction for Spidey. During one sequence, Venom turns his webbing on a police officer who had just fired shots at him (having the officer say “I never killed anyone before” is a nice touch from Michelinie). It’s a callback to Brock’s escape from the Vault in ASM #315 (though, this time around, Spidey is able to save the man in the nick of time before the webbing suffocates him). Of course, even with my biases, I admit that this script has its flaws. Primarily, Michelinie works in some of the ultra-campy Venom-speak, i.e. his desire to devour some of Spider-Man’s internal organs, including one “liver and Chianti” line that reference’s Silence of the Lambs. I never understood the appeal of evolving Venom into a cannibalistic B-movie-esque bad guy, rather than just the super-powerful lunatic that made Spidey’s life miserable in ASM #300 and later ASM #315-317. What makes this editorial decision even sillier is how, in trying to evolve the character, Michelinie and Marvel ultimately take away most of his nuance. 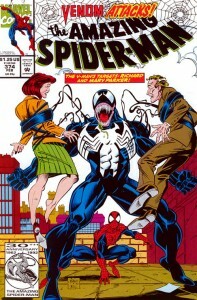 Considering how after this arc was scripted, Michelinie and Bagley followed up with the Venom: Lethal Protector series, which presents Brock as more of an anti-hero, having him run around making Hannibal Lecter jokes feels counterproductive to Marvel’s long-term plans with the character. Regardless of its flaws, ASM #374 ends with an excellent cliffhanger, as MJ has to tell Spider-Man that Venom ran off with her “husband’s parents,” providing a semi-mystery for Spidey to solve in order to save the day in the “giant-sized” (and foil enhanced) 375th anniversary spectacular (yay 90s!). For my thoughts on that issue, stay tuned to Chasing Amazing next week. I have a soft spot for this one as well, and not just for the awesome Bagley art. Venom’s characterization here is delightfully creepy, as he legitimately sees himself as the hero, and doesn’t seem to understand all the crap he’s getting from people. It’s a level of removal from reality that really adds a sense of insanity to the character. Of course, by this point the Venom “formula” is pretty well-worn: Venom used some trick of the symbiote to fool guards at the Vault and escape in a subplot from another issue, threatens Pete’s family, they fight, fight is interrupted, and Venom sets up a rematch someplace remote where they won’t be disturbed. The character didn’t need his own series at this point; he needed a break. Alas. I’m really really excited for next week simply put because ASM 375 was my first ever Spider-Man comic book!!!! A present from my father way back in 1993. You see I was really upset that Batman my all time favorite super hero was brutally beaten by Bane and replaced by DC in the Knightfall event. I think I may have cried a bit. My dad went out to the local shop and found this lil gem. Handing it to me he said this was a different kind of comic book starring his favorite hero from back when he was a lad. That was enough to get me interested and besides the obvious questions about his parents, wife, and why the hero feared this enemy instead of pounding him to the ground without a second thought, I was hooked. Spider-Man became my favorite Marvel read and I think it was mainly to do with Bagley’s art and Venom. Now while I have to agree with the other posters this book hasnt aged well or I simply matured enough to know good storytelling from the bad ones I still hold this issue in high regard because it’s my first one. You know what they say about your first one right? Thanks for the comment Darren. You should know that ASM #375 was also the first Spidey comic for my podcast-partner Dan Gvozden… and while it wasn’t my first, I will mention in my post next week a little something that caused me to pick this issue out of a stack of comic books back when I was a teenager… guess there’s just something about that cover that drew people in! It must be the foil webbing, or the large blurb at the top “30 years of Amazing Spider-Man”. Or that eternal stuggle of Spider-Man and Venom front and center that grabs your attention. There’s nothing else on the cover besides those two and red foil. It is an eyecatcher. *Gold! Not red, gold! Ahh you knew what I meant. 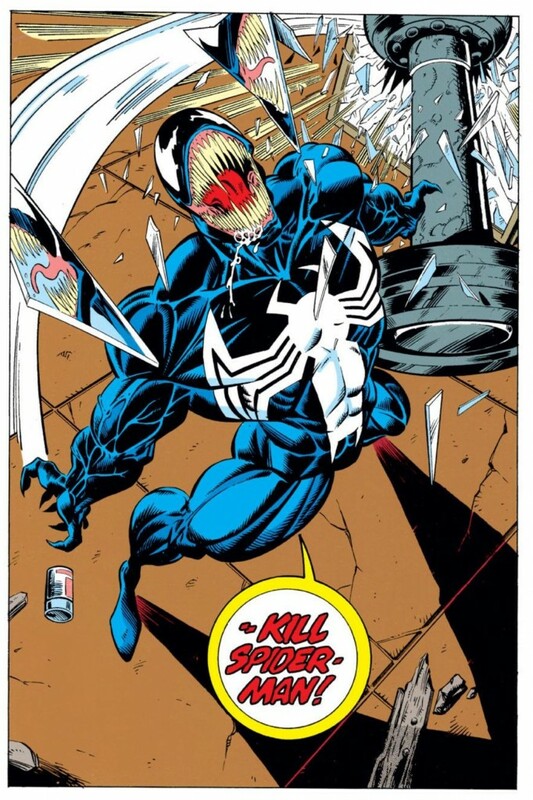 I would submit that the Venom / Spider-man fighting on the island was the last great 90’s story for Venom. I re-read this arc recently, and Bagley’s phenomenal art does a lot for it.